Quick and easy is the name of the game with this Simple Sweet Cornbread. The perfect eight ingredient side dish for your favorite soup, chili or stew that takes just 10 minutes to prepare. Original content posted February 2014. Updated October 2018. There’s a reason why I like to make chili, soups and stews as the weather turns colder. The reason, my friends, is simple. My Simple Sweet Cornbread recipe. I puffy heart love this cornbread. The texture of each crumb, the hint of sweet. This recipe makes a large 9″x13″ pan, yet it rarely lasts 24 hours in our house. 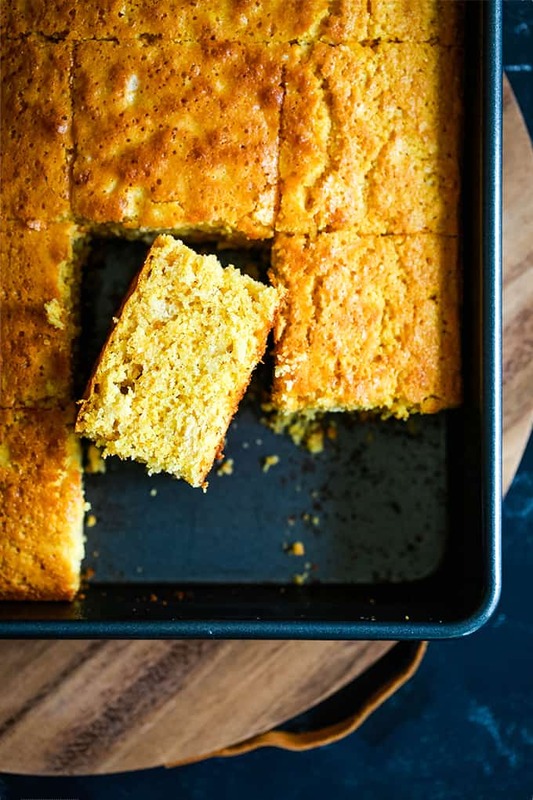 This Simple Sweet Cornbread ranks high on my list of comfort foods. I’m not sure if my love of cornbread runs strong as it was always served with a meal I despised when I was younger – my mom’s Ham and Beans, blech! – and it was my saving grace or that I’m simply a self-described carb lover. And for the record, my mother knows just how much I disliked that meal and we continue to joke about it thirty some odd years later. 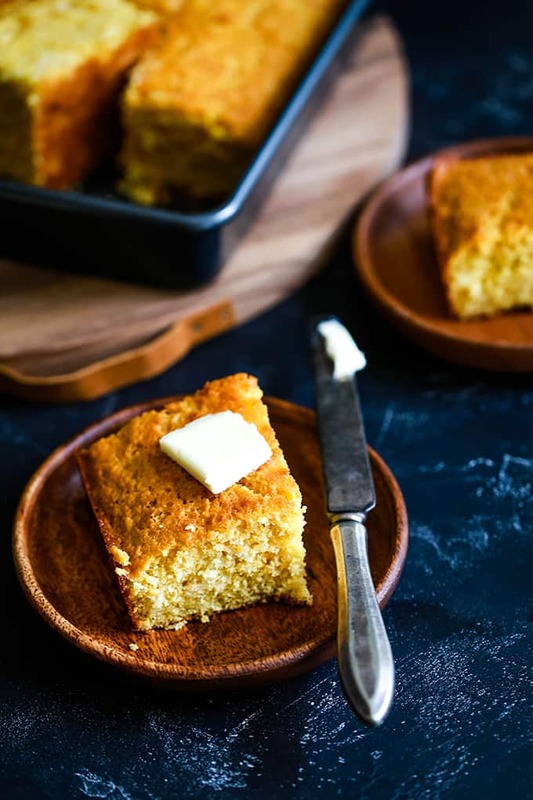 With just eight ingredients simply stirred together before baking, this moist Simple Sweet Cornbread couldn’t be easier. And when I say sweet, I don’t mean over the top. I mean a hint of sweet that sets it apart from those other cornbreads you might have tried before. It also happens to be the base of my holiday favorite Slow Cooker Cornbread and Sausage Stuffing. 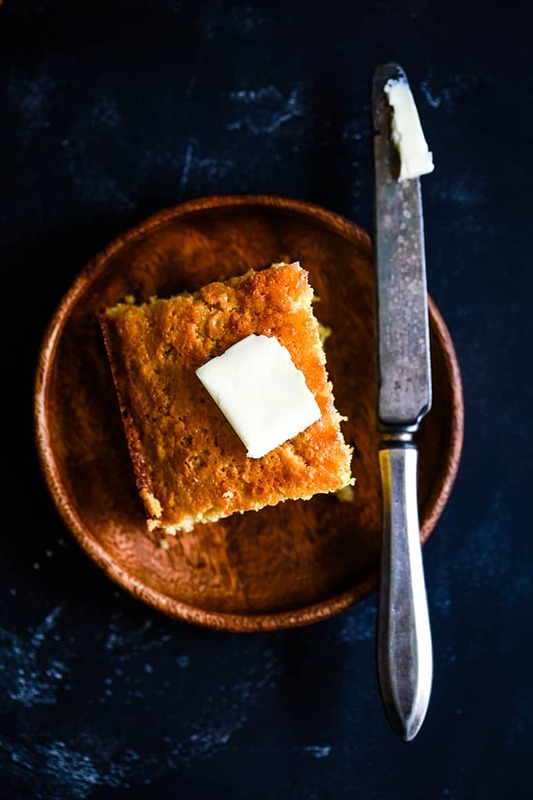 You likely have all the ingredients for this Simple Sweet Cornbread in your fridge or pantry. I know I do! That’s why it’s my go to, easy carb addition to so many meals. Don’t have buttermilk on hand? No worries! You can easily make your own by adding two tablespoons of white vinegar to a glass measuring cup and then filling with whole milk to the 2 cup mark. Let it sit for five minutes and then proceed to add it to the recipe as instructed. TIP: I’ve learned that buying corn meal from the bulk bin at your grocery store is the inexpensive way to go when you need to stock up on this staple ingredient. You’re then able to get the exact amount that you need without all of the extra packaging. And it’s typically cheaper to purchase it this way as well. WINNING. In a large sauce pan over low heat, melt butter. Turn off heat and stir in sugar. Add eggs and buttermilk and stir to combine. Stir in baking soda, cornmeal, flour and salt until well blended, but being careful not to over mix. Spray 9″x13″ baking pan with cooking spray and pour batter into prepared pan. Bake at 375 degrees for 30 to 40 minutes, or until golden and a toothpick inserted in the center comes out clean. Ready to be enjoyed as is, slathered with butter or as a side to my Beer Braised Beanless Chili, Stuffed Baked Potato Chili or Slow Cooker Chipotle Pumpkin Corn Chowder. 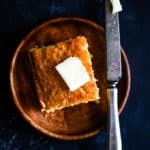 Sure, I’ve shared savory cornbread recipes with you before like my Cheddar and Cream Cheese Skillet Cornbread or my autumn favorite Pumpkin Cream Cheese Skillet Cornbread, but sometimes you just need the hint of sweet from this Simple Sweet Cornbread to cut the richness of a hearty soup, stew or chili. If you happen to have any leftovers, it also makes for a great sandwich the next day, splitting it in half and adding ingredients to the middle. Yes, I speak from experience. And yes, it’s just as delicious as it sounds. Eight ingredients, a bowl and a wooden spoon. That’s all there is to this Simple Sweet Cornbread. The perfect side dish for your favorite comforting soup, chili or stew. Stir in baking soda, cornmeal, flour, and salt until well blended, but being careful not to over mix. Spray 9"x13" baking pan with cooking spray and pour batter into prepared pan. My Simple Sweet Cornbread would also be a great substitute for a boxed mix in this savory Mexican Cornbread Casserole, this hearty Chili Cornbread Bake. I also love the idea of using any leftovers to make Cornbread Croutons. Adding this to my must-make list! Looks yummy!! Will the recipe work just as well if I reduce it in half and use an 8" square baking pan? It disappears quickly at our house! YUM!! Can't wait to try this with some of my fall soups that I'm making soon! WOW...how deliciously does this look! I like the short and simple list of ingredients. Great idea for lunch with soup. Hands down my favorite corn bread recipe! 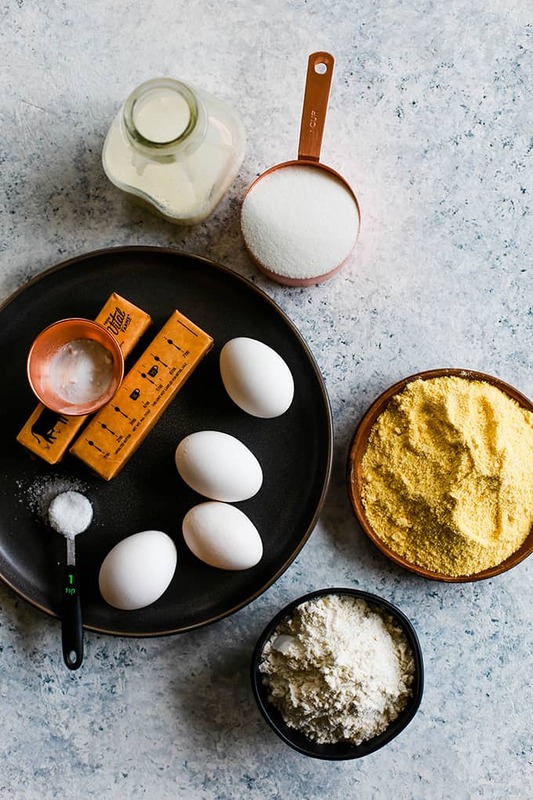 This Simple Sweet Cornbread looks super easy and full of ingredients my family loves. Looking forward to trying soon. This cornbread is so yummy. My whole family loved it. Thanks for the recipe! So glad you enjoyed it as much as we do, Jennifer! Indeed my favorite cornbread ever. Thanks so much for taking the time to let me know you liked it! I recently made this and thought it was wonderful. I am including it in our menu plan for 2.2 on our blog. I hope you dont mind us sharing. 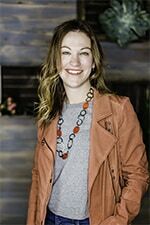 Thank you so much, Emily - it's my absolute favorite cornbread recipe! I want to make this but something isn't clear to me in the instructions. Do you use 1 cup salted or unsalted butter? Seems like that could make a big difference. Thanks in advance!! Hi, Lisa - I always use unsalted butter in my recipes. Hope that helps! Oh yum!!!!! 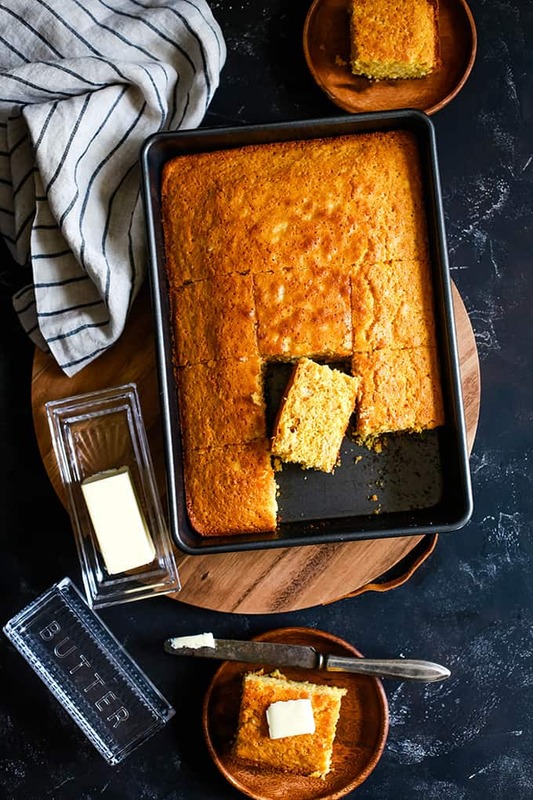 I have been craving some sweet and yummy cornbread! Off to get some buttermilk! Thanks, Dee! And if you don't have buttermilk, you can definitely use the vinegar/milk combo to make your own! I have some cornmeal in my pantry that really needs to be used. I need to just make this and be over with it. Pinning now! 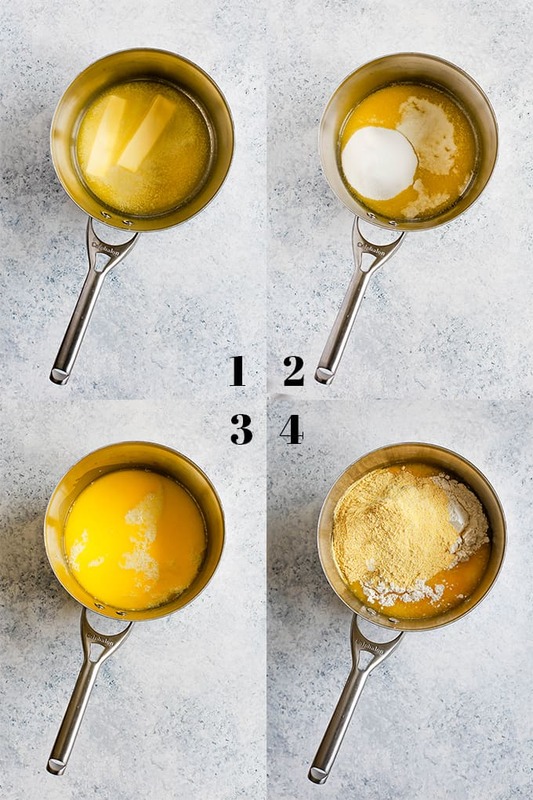 I noticed that there are two different pan sizes mentioned in the recipie. 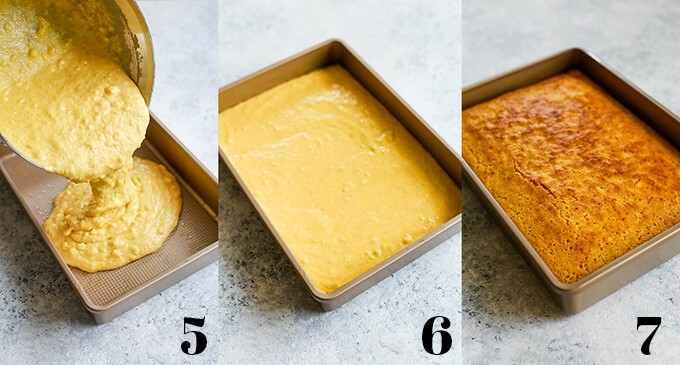 If I use a 9x13 pan, will the cornbread be as thick as pictured above? Do I need to adjust the cooking time if using the larger pan? This was my favourite snack when I was a kid! My mom taught me how to do it and I regulary make this, when there is nothing sweet at home and you just need something to calm your sugar down :)It's great because you can spread nutella or jam (or even peanut butter AND jam) on it. I don't use sugar in my recipe, mainly because of that.Best of all - it's quick and fairly simple to do! 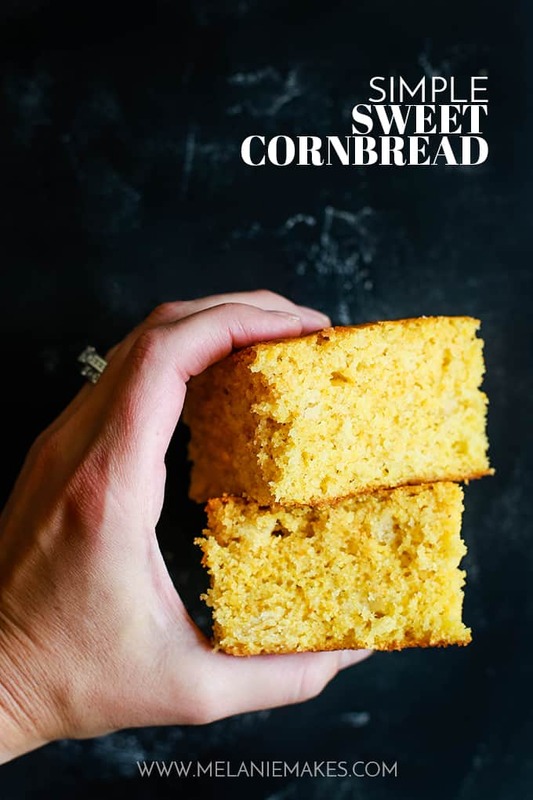 Whether it's been me or the recipes I've tried, or both, I have had a nasty result with cornbread....this recipe here, though, has got my attention and stirred up my nerve to try try again! I'll let you know how it goes! !